Hillsborough: Did Gate C Even Matter? On the subject of the Hillsborough Disaster, I am sure that many people will be familiar with the stale, uninformed arguments that apologists for the South Yorkshire Police never tire of making. Most commonly, this will be the old, “Well the Police wouldn’t have had to open the Gate anyway if all those hundreds of drunk fans hadn’t turned up late, without a ticket” etc etc complaint. As I have detailed elsewhere, this is not what happened, but I have an unusual, and hopefully refreshing, angle for countering the argument from. Even if the myth did have any credence, and the evidence overwhelmingly shows that it does not, it makes little difference in any case. This is because, directly speaking, the opening of Gate C had very little to do with causing the Disaster, irrespective of why the Police chose to open it, and arguments about supporters being to blame for it being opened are not only inaccurate, they are also scarcely relevant. The opening of Gate C should really be viewed as just a curious, if rather large, side-detail in the events of the day, and not central to what happened at all. 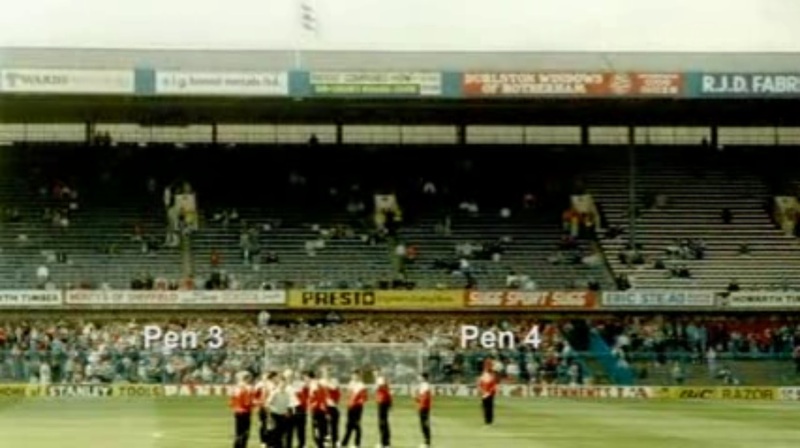 If one is to understand the Disaster, it needs to be recognised that there were in fact two crushes at Hillsborough that day and not one – one outside the turnstiles on Leppings Lane, where a disaster was narrowly avoided, the other in the ground level terraces inside the stadium, where disaster struck profoundly. One common interpretation of this is that when overcrowding in the street outside the stadium threatened to cause deaths, the police opened the outer gates of the ground to relieve the crowd pressure, and when the fans flooded in, they stacked into terraces that were already full and caused another crush, this time a fatal one, against the front fences. This is certainly far closer to the truth than the mythical version in the first paragraph, but even so, it is not strictly accurate. The two crushes did not happen in sequence, the one leading on to the other, as many people assume. Instead, they formed independently of each other and in large part they were both in progress at the same time. Video footage captured at the time supports this impression. This was over three-quarters of an hour before the Police opened Gate C, and indeed was earlier than the worst of the overcrowding at the turnstiles outside. The critical mistake the Police made was not in opening the gate – that was actually the right thing to do as it prevented a disaster happening outside the ground. Instead, it lay in failing to close off the tunnel leading into pens 3 and 4 once they were full. But what is not often understood is when exactly that mistake was made. Maximum capacity was not reached only after the gate was opened, but far earlier. Yes, it was a “blunder of the first magnitude” (quoting Lord Justice Taylor) not to close the tunnel before opening the gate. But in fact, it was a blunder regardless of what was happening in Leppings Lane. The whole Liverpool fan base could have been behaving like the finest of gentlemen, could have all arrived by 2:15pm, every man-jack of them in possession of a ticket, and could all have been sober as a priest on Sunday morning (which was largely true of the great majority of them anyway), all the turnstiles might actually have been working properly, difficult as that is to imagine, and the Police might never even have had to open Gate C.
And my suspicion is that the Disaster on the terraces would still have happened. This was because the Disaster was triggered by where the fans were going (pens that were full), rather than what the fans were arriving through (either a gate or a turnstile). To repeat, the key blunder was in fact made far earlier in the build-up to the game than is often realised. The tunnel leading into the central pens should have been closed before 2:30pm (over twenty minutes prior to Gate C opening). But the match commander, Superintendent David Duckenfield, and his officers failed to monitor the crowd build-up on the Leppings Lane terraces effectively. It does not make a great deal of difference what followed on Leppings Lane itself, as soon as the central pens were full, the tunnel needed to be closed, and it was not. With the failure to do this, given the very poor signposting beyond the turnstiles, and the ambiguous wording on the match-tickets, it was inevitable that most newly-arrived fans would head for the tunnel leading into the central pens; there was little to indicate that the side-pens even existed, while the lay-out beyond the turnstiles was such that the tunnel was the only visible path ahead. With this in mind, it becomes clear that there was every danger that the overcrowding would continue to get worse in the central pens, irrespective of how fans were getting in, be it through an open gate or by continuing to come through the turnstiles. Either way, they would still have had the tunnel directly ahead of them, and it would still appear to be the only way to go. So they would still have ended up haplessly massing in pens that were already overcrowded. This is not to say that the decision to open Gate C was not significant at all. It probably sped up the process of overcrowding considerably, as the extra fans got in more quickly as a result, and en masse rather than in ones and twos, which must have caused an immediate ‘spike’ in pressure. (The collapse of the crush barrier in the stands around kick-off time might be attributed to this, although as it does not appear to have happened until about seven minutes after the gate was opened, that is questionable.) Opening the gate may also have reduced the amount of time the Police had available to notice the emergency. But given how inept Duckenfield seems to have been at spotting the danger-signs, and how casual many of his colleagues’ attitudes seemed to be, I strongly doubt that they would have noticed it, even if it had taken three hours for the fans to start pouring over the fences – the danger-signs would simply have been correspondingly delayed. In any event, it remains gross negligence on Duckenfield’s part that he again failed to check how crowded the central pens were when he decided to open the gate. Opening the gate was a big step, and he was duty-bound to consider the possible consequences of such an action, including the danger of overcrowding, before committing to it. But there is every likelihood that the crush in the central pens would still have turned fatal even if Gate C had remained closed, and even if there had been no crush in Leppings Lane at all; probably it would have tipped over into a disaster about fifteen minutes later than it actually did, but that is about the only major difference it would have made. The business of opening Gate C takes the form of rather a misleading distraction, and the amount of attention that moment is given perhaps offers the Police-apologists some ‘ammunition-for-argument’ that is not really due or relevant. Whether the Liverpool fans ‘forced’ the Police to open the gate or not is immaterial, because the opening of the gate was not what led to the Disaster. The failure to close the tunnel when the central pens were full was what led to the Disaster, and there is no credible way at all of arguing that the Liverpool fans ‘forced’ the Police to make that mistake. Ninety-six football supporters lost their lives at the FA Cup semi-final played between Liverpool and Nottingham Forest, played at the Hillsborough Stadium in Sheffield on April 15th 1989. 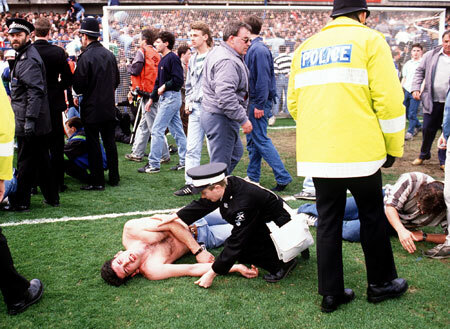 It was the worst stadium tragedy in the history of British sport, and given it happened at the end of the most violent decade English football has ever known, it has often been seen as the culmination and peak of the hooligan trouble that was so prevalent at the time. However, this is a false context, and casts the horror of that day in a violent light that it does not deserve. 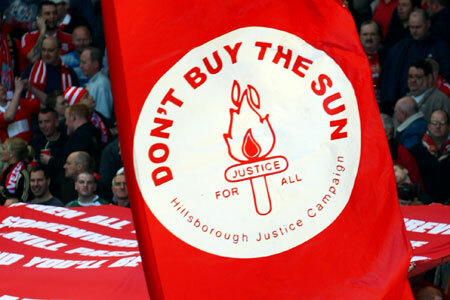 In particular, fans of rival clubs such as Manchester United and Chelsea are often keen to use Hillsborough as grounds for hugely over-generalised condemnation of Liverpool supporters. While the behaviour of some Liverpool fans on the day of the disaster could have been somewhat better, it was never anything egregious, and what is more, it is highly likely that the events of the day would have turned out much the same either way. There are a number of widely-held myths about this disaster that are still in need of puncturing after over two decades, and, although I see no reason to assume I shall be successful – some people always believe the worst in others because they want to – this is what I am aiming to do in this essay. It is true to say that the Heysel Disaster of 1985 was a riot in which Liverpool supporters were probably the chief culprits (not that the Juventus fans behaved much better – indeed Juventus fans carried on rioting for several hours after the Liverpool fans had calmed down), and this, by telescopic logic almost, leads many to assume that Hillsborough was more of the same. 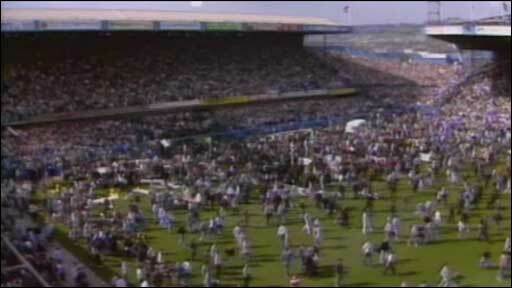 The Hillsborough Disaster was not a riot however, there was no actual violence that day. It was a huge and tragic accident caused, not by fighting, but chiefly by overcrowding, out-dated stadium design, and poor policing. 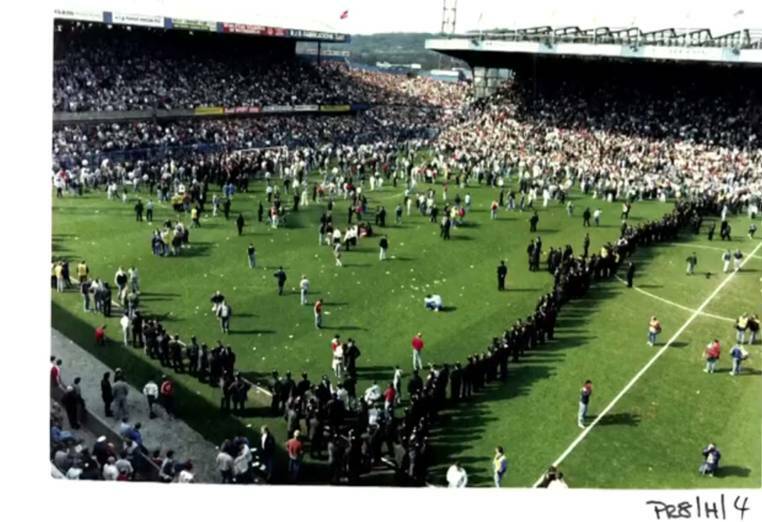 This was a myth put about by the Match Commander of South Yorkshire Police, Chief Superintendent David Duckenfield (with the eager assistance of the right-wing media in London), to deflect blame from himself for his poor handling of the crowd. Firstly, the gate was not forced open. The Police opened it themselves to relieve a growing crush in the street outside the stadium. This crush was caused by an excessive build-up of fans queuing at the Leppings Lane end, the smallest stand in the ground, and the one with the fewest turnstiles. With the number of supporters building up far faster than fans could get through the turnstiles, a lot of people found themselves getting squashed against the outer walls of the stadium. The entry concourse on Leppings Lane simply was not wide enough to cope with the numbers involved, and did not have sufficient points-of-entry. Secondly, hardly any specific instances of supporters showing up without a ticket have ever been cited. Officers on duty outside the Leppings Lane turnstiles reported very few examples at all. It seems highly likely that a few fans did arrive ticketless of course, as happens at almost any game, but the idea of ticketless masses has the status of a wild guess. Furthermore, the theory of ticketless masses simply does not fit the facts. If thousands of Liverpool supporters had entered the stadium without tickets then all the enclosures at the Leppings Lane end would already have been about full by the time the crush had turned critical. But this was not the case. The central enclosures (pens 3 & 4) were crammed, but the wing-pens on either side were barely half-full. A subsequent analysis of the day’s events by the Health & Safety Executive concluded that the total number of supporters in the Leppings Lane terrace at the time of the Disaster (approx 9,734 – probably needs to be revised upwards by a couple of hundred to take into account fans who might have entered through the wrong turnstiles, or the like) was clearly lower than Liverpool’s full ticket allocation for that part of the stadium (10,100). Therefore, for hundreds, or even thousands (as some suggest), of ticketless fans to be present requires a remarkably similar number of ticket-holders to be absent. Did a quarter of the people who had paid good money for tickets just randomly decide not to go to the game that day? And by coincidence, almost exactly the same number of ticketless fans got in in their place? Even if we are to accept this suspiciously coincidence-dependent explanation, ticketlessness clearly could still not have caused the Disaster. Ticketlessness will lead to overcrowding if it causes a terrace to go over its capacity. This did not happen, therefore the cause of the Disaster must have been something else. One of the iconic images of the disaster, as dozens of people are graphically seen to be crushed against the fence, many, like the three right at the front, unable to move a muscle. Again, it seems fanciful indeed to suggest that none of the fans who arrived at the ground that day were drunk. Once more, it was just what fans always did before a big game back then. But any who were drunk were in a tiny minority, and again, it is noticeable that no specific examples of fans who were drunk in the ground itself have ever been highlighted, except in very generalised, much-challenged anecdotes. In any event, what loutish behaviour there was had no bearing on the day’s events. The deaths, which only happened after the Police chose to open an outer gate (the notorious Gate C) normally meant as an exit, were caused by a large influx of extra supporters entering the Leppings Lane terrace to escape the growing crush in the narrow entry concourse outside. There was a tunnel going under the West Stand, leading into these ground-level central enclosures (or ‘pens’ as the Police preferred to call them, underlining how they truly regarded football fans as just animals). 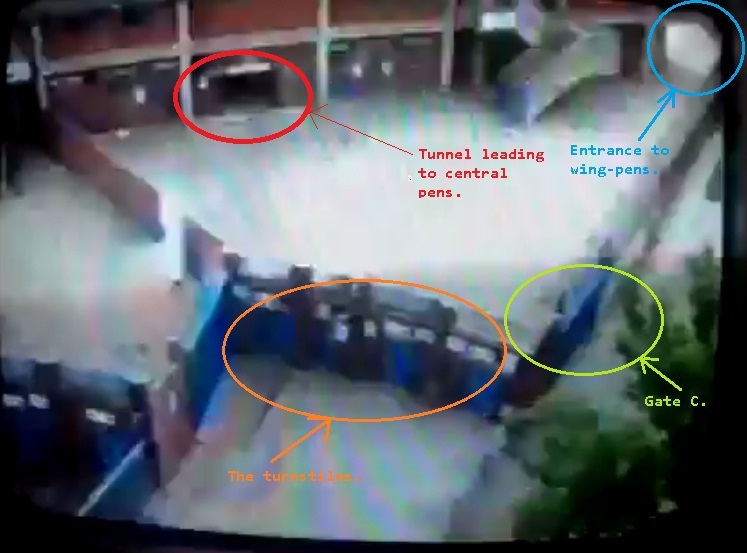 This tunnel had been left open by the Police when they opened the outer gate, and the fans, more or less carried on by the enormous weight of panicking people behind them, were drawn involuntarily down the tunnel into pens three and four. Unfortunately, these pens were already full to the rafters with supporters who had arrived earlier. Had the Police kept their cool for several more minutes and closed off the tunnel before opening the exit gate – indeed they should have closed the tunnel about twenty minutes earlier – the Disaster would never have happened. There were several side-pens in the Leppings Lane stand that were still sparsely occupied, and if the central tunnel had been closed off, the fans could have been redirected to these emptier pens instead. People further back in the mass of new arrivals of course had no idea what was happening up ahead. On quite a steep downward gradient, the tunnel was low, cramped, and crowded, offering no intelligible view of the masses already in the stand. The new arrivals were all carried along by a mix of panic to escape the crush outside, and the enormous weight of people around them. By the time any of them realised that they were heading into enclosures that were already full – if they ever did – it was too late for them to turn back, as there were so many more people following them down the tunnel, blocking off the way out. The official ‘safe’ capacity of the central enclosures at ground level was two thousand people. A later analysis by the HSE concluded that the facilities were inadequate, and that this maximum should have been reduced to under one thousand seven hundred. It is estimated that over three thousand fans were in the two central pens at the time the game kicked off, and counting. With the crowd inside the central pens now nearly double its safe maximum capacity, and still more fans heading down the tunnel, people at the front of the stand found themselves increasingly getting pinned against the perimeter fence designed to keep fans from getting onto the field of play. Soon, people were getting crushed, were unable to move their own limbs, were even struggling just to breathe in and out. Then a crush barrier near the front of the enclosures finally gave way under the enormous weight of bodies, and fans who had been propped up against it started lurching forward en masse, falling to the ground, and causing a narrow, diagonal column of people behind them, leading all the way back to the tunnel, to fall over as well in a chain reaction. Many people had already lost consciousness, but now people started to die in great numbers. 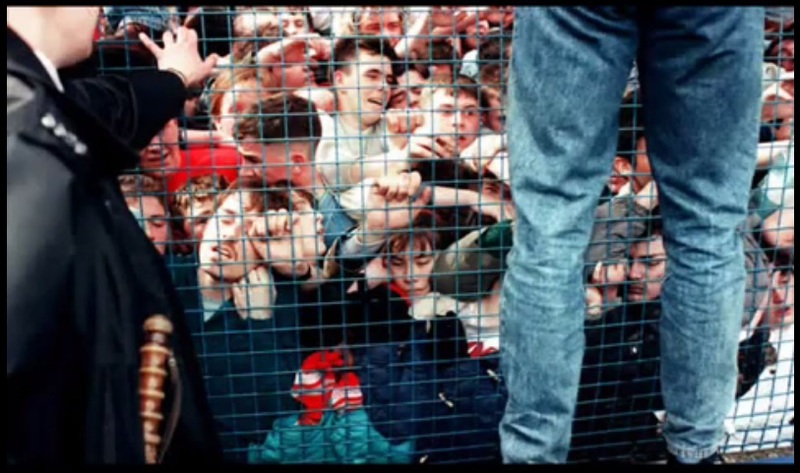 It is sometimes suggested that when the gate was opened, the huge mass of fans outside the ground, more concerned with not missing the start of the game than with conducting themselves with due care and attention, rushed straight for the tunnel before the police could instruct them otherwise, and ran down it into the central pens, hammering into the backs of the fans who were already on the terraces, with the knock-on effect of people at the front being crushed to death against the fences. 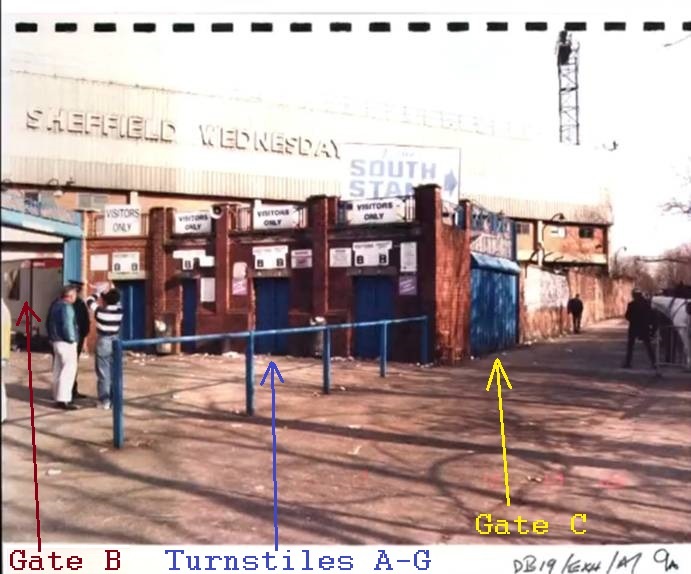 But CCTV pictures taken at the Leppings Lane entrance when the gate was opened (again, (see the footage at http://hillsborough.independent.gov.uk/repository/media/VID0002.html) show very clearly that the fans did not run into the tunnel, they were all moving at walking pace. The pressure of so many people in such confined space at times created an irresistible momentum, but it did not all happen in a crazed rush. The myth of a high-paced stampede is another notion that does not meet the demands of simple logic. Gate C was opened at 2:52 pm. The game was abandoned by the referee at 3:06pm, and from that and from eyewitness accounts from the day of the tragedy, we can reasonably conclude that the crush in the stands must have reached disaster point at around 3:01pm. (Video footage also suggests this.) Let’s be generous to the Police though and say it was about 2:58pm. Now, the distance from Gate C to the far end of the tunnel was, at a generous estimate, about eighty feet. How could a mass, high-velocity stampede require around six minutes to cover just eighty feet? It just does not make sense. No, there was no such stampede. The process of the crowd build-up was a very gradual, almost insidious business, with the congestion in the central enclosures reaching danger level almost imperceptibly, over the course of long minutes. Indeed, the overcrowding in the central pens began long before the gate was opened; survivors of the crush recall being in discomfort as early as 2:25pm, over half an hour before the problem reached Disaster-point. Any stampedes – and there is no evidence whatever that any such stampede ever happened – were not a cause of the Hillsborough Disaster. Fans in the seating area of the West Stand above the terrace managed to rescue some of their fellows from the central pens below by actually reaching down and hauling them up into the upper tier. In fact, many of the fans who did not get into the stadium until after Gate C was opened had already been queuing for around half an hour. They couldn’t get in earlier because there were too few turnstiles at the Leppings Lane end of the ground, which was causing a dangerous ‘bottleneck’ as more and more fans arrived from both the north and the south. Over twenty-four thousand fans had to get into the stadium through just twenty-three turnstiles. (Furthermore, the ten thousand-plus of them who had tickets for the terrace had to get in through just *seven* turnstiles.) Whereas the Nottingham Forest fans, totalling a little under thirty thousand, had sixty turnstiles to enter the ground through. The Police policy of having all the Liverpool fans enter through Leppings Lane, while the Nottingham Forest fans be allocated all the turnstiles in the south and east stands, was very foolish. Also, many of the people who did arrive late did not do so because they were pubbing. Instead, they were delayed by roadworks on the journey east along the motorway from Merseyside – roadworks that the authorities and media had done little to draw attention to beforehand. Had they done so, far more Liverpool supporters would have set off for Sheffield a fair bit earlier in the day. When the overcrowding outside the stadium was becoming evident, the Police’s handling of the problem was again poor, as they could easily have requested that the kick-off be delayed by twenty minutes to give more time for fans to get in, and so reduce panic outside the ground. They did not do so. 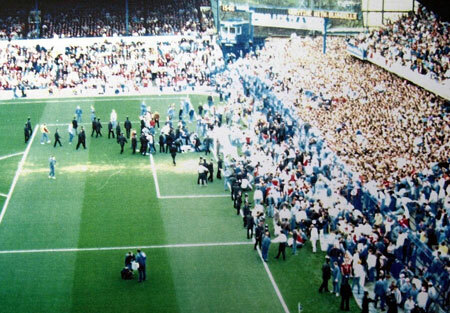 Furthermore, approximately one quarter of the people who died at Hillsborough were among the fans who entered the ground after the Police had opened the exit gate. Many people died at the front of the stand when they were crushed against the fences, yes, but others died further back when they were taken off their feet and then inadvertantly trampled on by people around them. And some of those who arrived through the gate still wound up at the front fences, due to the poor layout of the crush barriers allowing a lengthy, uninterrupted, diagonal channel of movement. Again, the implausibility of the ‘lateness’ myth makes it hard to entertain. 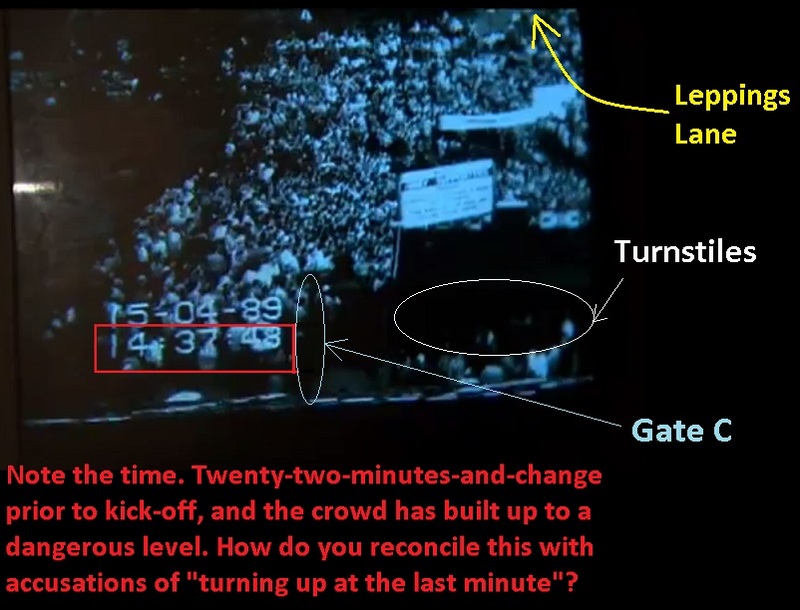 If the crush in Leppings Lane was caused by fans showing up in the last couple of minutes, why was the exit gate opened to relieve the crush at 2:52pm? Why indeed was the initial request by the Police officers on duty at the turnstiles for permission to open the gate placed at 2:47pm? Are we expected to believe that the Police wanted to open the gate to relieve a crush that hadn’t even formed yet? And even then, after this remarkable moment of apparent clairvoyance, the crush formed anyway? Quite the contrary, the Police were the ones obstructing the Liverpool fans as they tried to help each other. 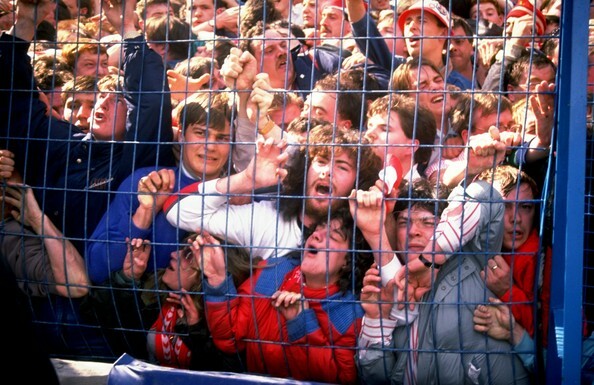 As the crush against the fences began to build up, many fans right at the front tried to climb over the fences and get out onto the pitch, as it was their only escape route. The Police, pre-judging this to be a pitch invasion, kept intervening and forcing the desperate supporters back into the growing mass of bodies. Later, the Police even went as far as to stop ambulances from getting into the stadium to help rescue the injured; it is frightening to contemplate how many extra deaths this might have led to. Because the Police took so long to twig onto the fact that there was no riot going on, the Liverpool supporters were forced to try and help each other to climb over fences, or even to climb up into the upper tier of the West Stand. Liverpool supporters were largely trying to do the job of the emergency services; evacuating the pens, administering First Aid to the injured, even tearing down advertising hoardings to use as makeshift stretchers (with the Police sometimes trying to stop them doing even that on the grounds of it being ‘vandalism’). The idea that the Liverpool fans tried to obstruct rescue efforts is not only a crude smear, it doesn’t even fit the scenario remotely. It is quite clear from the pictures that there was no chance for any of them to do any such thing, they were either struggling for their lives, or struggling to save the lives of others, while most of the Police had formed a futile and quite unnecessary cordon near the halfway line to keep the fans of the two clubs apart – trying to quell a riot that was patently not going to occur. Too many people, too little room. Perimeter fences that were used routinely at British sports grounds in the 1980’s, as a method of crowd control, turned stadia into death-traps. Thirdly, in 1946 there was a game between Bolton Wanderers and Stoke City, and a series of events that were chillingly similar to Hillsborough were played out, causing a crush that took the lives of thirty-three supporters at Burnden Park. The two Disasters in fact were so similar that one can almost thank heavens that the death-toll at Burnden Park was so much lower. When one also considers the Ibrox Disaster of 1971, which took the lives of sixty-six supporters of Glasgow Rangers in a crowd crush when large numbers of people fell down an exit staircase, or the Valley Parade Fire of 1985, which took the lives of fifty-four Bradford City supporters and two supporters of Lincoln City, it seems odd to suggest that Liverpool supporters are particularly prone to be involved in these sorts of calamities. Almost half a century on from Burnden Park, history had been allowed to repeat itself on an amplified scale, time after time, and both football and wider authorities had still not learned the bitter lessons of one year after the Second World War. Trying to scapegoat Liverpool supporters for a problem that was clearly still endemic across the British game seems like cheap self-deception. The horrors of Hillsborough were exacerbated in the aftermath for those who lost relatives when these myths were put about, not least by the Police themselves. A needless death of a loved one is terrible enough to endure without having to hear people insinuating that they in some way deserve it. To cover up their own failures, that was precisely what the Police insinuated, and so a period of mourning was interrupted by a needless struggle to clear the names of the dead. Hillsborough was not a riot. It was a calamity, while the subsequent myths about how it came about are a tragedy in their own right. The victims of the Disaster, no longer alive to defend themselves, have been wrongly incriminated for their own deaths, and this is a stigma that some people won’t allow them to be separated from. 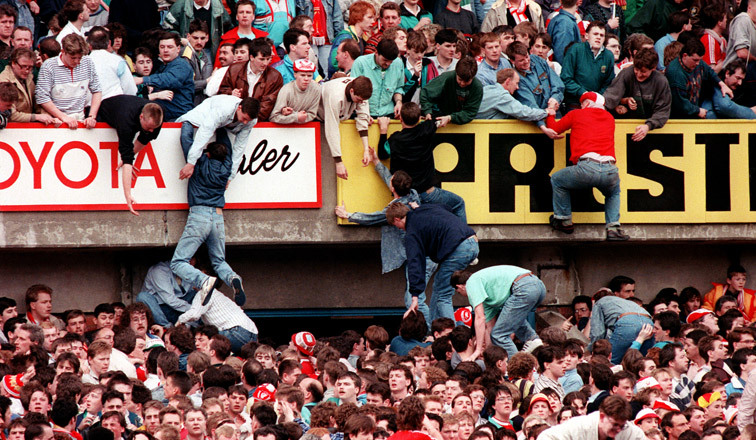 * Keep an eye open for other articles on the subject of Hillsborough on this blog. The first disputes the common assumption that the opening of Gate C had a decisive bearing on the crush on the terraces.